The first time I read Sugar Daddy was in my senior year of college, and that was six whole years ago. I've read bits and pieces of it every so often, but I've never dedicated some time for a full reread... until now. And boy, was that one of the best decisions I've ever made! I really have so much love in my heart for Liberty Jones and Gage Travis, Liberty's little sister Carrington and the rest of the Travis clan. Liberty's story is remarkable. She faces so much adversity at such a young age, and seeing her struggle to stay strong in the face of every little thing that threatened to bring her down was so heartbreaking. She was smart, determined, hard-working and she was determined to make a life for herself and Carrington - and she succeeded. The cherry on top of the cake is watching her develop a relationship with Gage Travis. Their trope (the hate-to-love scenario) is one of my favorites when it's done well, and Lisa Kleypas is an expert. I'd happily recommend this one, particularly because it's just the right mix of contemporary romance and women's fiction. I can guarantee it'll leave you smiling when you reach the end! Honestly, Smooth-Talking Stranger is probably the Travis novel I've reread the least number of times to date. I don't know why that is, considering how giddy I was as I reread it this time around. As always, Kleypas manages to give readers two lovely new characters to fall in love with - Ella Varner and Jack Travis. Jack is the second oldest Travis, and someone we really start getting to know a bit better in the previous novel. What I love most about him is that he's unapologetic about who he is and what his interests are. He's also a respectful, ambitious gentleman who goes for what he wants and will love and respect what he has. Just thinking about him makes me awfully swoony, and it was exciting to really get to spend some time with him. And, as with the previous novels, I loved the heroine Ella. She's the girl who has risen above her past, a girl with goals who is still willing to drop everything to help her sister out. She's responsible, smart, independent, but she does find herself getting vulnerable as she falls in love. I loved these two so much that it's honestly not a surprise that I adored their romance, even with all the extraneous circumstances that they have to go through. It's charming, it's sweet and it's 100% the stuff that romantic comedies are made of - which is exactly why I loved it so. I'll be honest and tell you that, for a very brief nanosecond, I had my doubts. It had been years since Sugar Daddy, Blue-Eyed Devil and Smooth-Talking Stranger had stolen my heart, and I worried that the magic would be diluted in Brown-Eyed Girl. But I was so damn wrong, and I'm pleased as punch to admit it! I should never doubt Lisa Kleypas' ability to tell a story, or the Travis clan (and friends) and their ability to leap right off the page and into my heart. Brown-Eyed Girl was a magical reading experience, y'all, and it's an excellent addition to this series. It did feel a bit more like women's fiction than a contemporary romance, particularly since Avery spends a lot of time coming to terms with who she is and what she wants. There was just the right amount of swoons, humor and feels, and there were also cameos from other members of the Travis clan, which I loved. I loved Avery with her no-nonsense business sense, her good heart and her vulnerability. I loved Joe with his good heart, his easygoing nature and his love for his clan. All in all, Brown-Eyed Girl was so worth the wait, and a must read for anyone who loves the Travis clan as much as I do! You may have convinced me to give this series a try. I love all of Kleypas' Regency romances but I've always felt a bit iffy about contemporary romance. It seems like Kleypas couldn't write a bad book if she tried, so I'm adding these to my TBR list! I've heard such wonderful things about this series, but I've never read it. I do love Kleypas's historical romance so much though. I should really read these. Love the mini reviews!!! This series is outstanding. 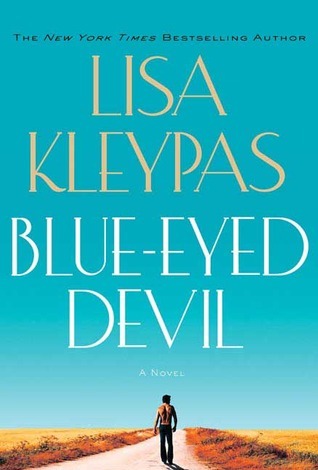 And its Lisa Kleypas and she delivers some of the best romances I have ever read. Blue Eyed Devil is my favorite, probably because it was the first one I read of the series, and I had it in audio format and boy I loved Haven and Hardy. They just fit so well together, and there are so many fun moments between them. The first book I really liked too, and I wish I had read that one first, so I could have had a bit more background on Hardy. The third book was so fun and had a easy going feel to it. I have yet to read Brown Eyed Girl, but I am on the waiting list for it at my local library. All I saw was the title of this post & thought "awe" & then when I clicked on it I thought "OH HELL YES! HARDY CATES!" haha I'm so glad we've found a series to bond over. I love me some Travises, that's for sure. I feel like I need to reread this series. I admit I didn't love the first two books when I initially read it, but time changes opinions! Wonderful series review, Alexa. I’ve only read the first book and I loved it. I have all intentions to continue.